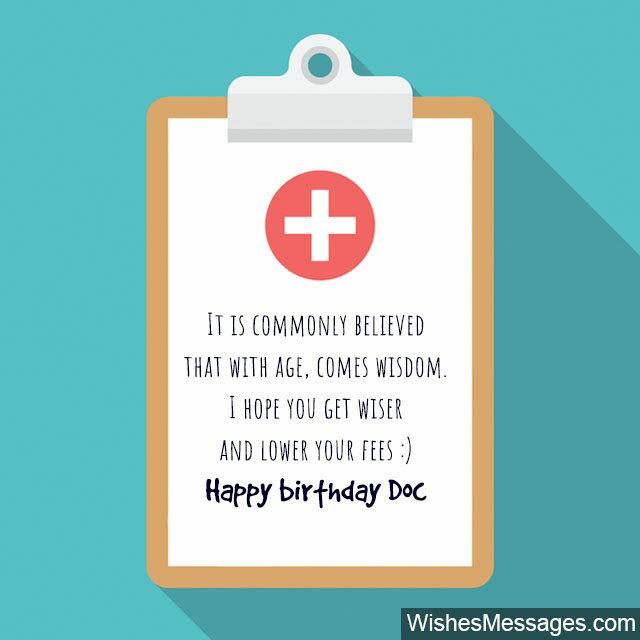 Birthday Wishes for Doctors: A cute birthday quote for your favorite doc? Why not! After all, a doctor’s life may seem colorful at the outset, but behind the rosy picture lies years of grit, hard work and sleepless nights. A lot of nasty things are said about the medical system in general. But at the end of the day, it is hard to overlook miracles that these men and women perform. Doctors save lives, cure diseases and more importantly, they are mankind’s sign of hope. Wouldn’t hurt to put a smile on that face now would it! 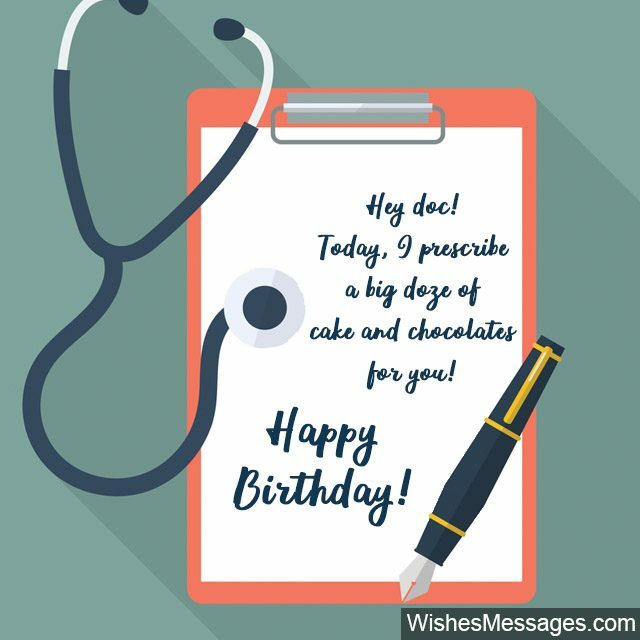 Take ideas from this post to write funny quotes, humorous greetings and touching messages to wish your doctor a Happy Birthday. A sweet card or a cute note will make a doctor’s night shifts and emergency calls worth the effort. On a selfish note, your nice gesture may even get you preferential treatment on your next visit! 2) It is hard to find a gift for a man whose profession is to give mankind the gift of life. Happy birthday doc. 3) Ordinary medicines have extraordinary healing powers when they are prescribed by loving doctors like you. Happy birthday. 4) Dear doctor, I have a love-hate relationship with you. I love your advice, but I hate your fees. Happy birthday. 6) Doc! There is nothing worse than watching you turn a year older, doc. I want you to get younger, so you can keep treating me for the rest of my life. Happy birthday. 7) I never eat apples because I don’t mind visiting an amazing doctor like you. Happy birthday. 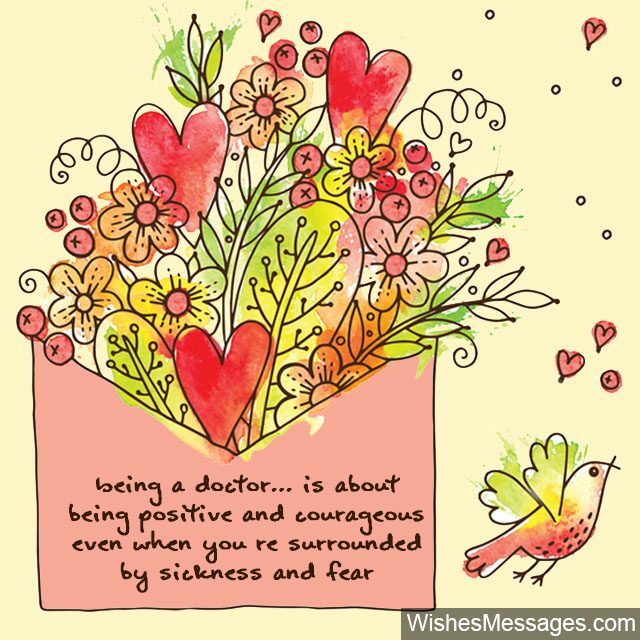 8) Doctors are people who master the art of being positive and courageous even when they’re surrounded by sickness and fear. Happy birthday to one such master! 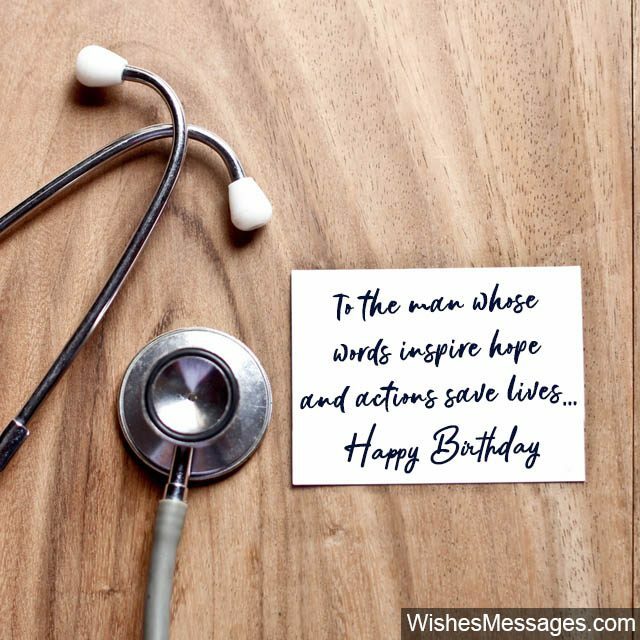 9) A lot of doctors have fancy degrees but very few doctors like you put their heart before their mind while giving patients the best medicine in the world – HOPE. Happy birthday doc. 10) Any doctor can prescribe drugs but very few can prescribe the best of them all – a STRONG WILL to get better. Happy birthday doc. 11) Dear doc, I like you but my wallet hates you. Happy birthday. 12) I can’t explain how you’ve changed my life. Just knowing that you’re a phone call away, gives me the strength to fight anything that life throws at me. Happy birthday doc. 13) It is commonly believed that with age, comes wisdom. As you turn a year older, I hope you get wiser and lower your fees. Happy birthday doc. 14) Dear doctor, you are the only person in my life who I am glad to know but afraid to meet. Happy birthday. 15) Most doctors understand medicine. Most doctors understand surgical procedures. Most doctors understand drugs. Most doctors understand diagnosis. But few doctors like you understand the most important of them all – a patient’s SUFFERING. Happy birthday doc. 16) Not a day in my life goes by when I don’t feel thankful for crossing paths with an angel like you. Thank you for everything doc, happy birthday! 17) Your prescriptions heal the body but your inspirational words heal the mind. Happy birthday doc. 18) Very few people in the world are blessed to be in a profession where their work makes a difference in so many people’s lives. Happy birthday doc. 19) Happy birthday to the man whose words inspire hope and actions save lives. 20) Few doctors like you spend a little more time with their patients to give them a sense of care and comfort – the biggest healer known to mankind. 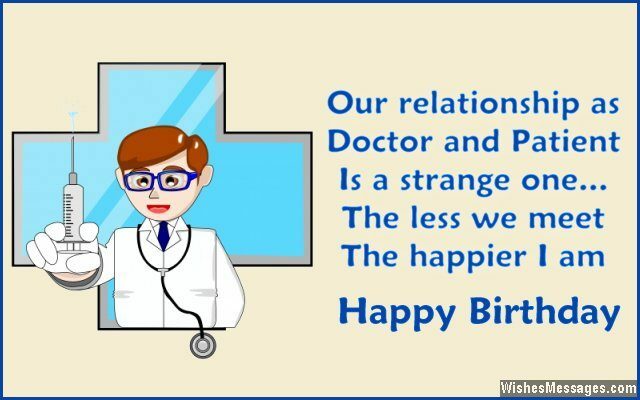 Happy birthday doctor. 21) Happy birthday to the doctor who gives less medical jargon and more hope. 22) Dear doctor… despite the fact that I respect you, admire you and feel a sense of comfort when I am around you, I hate visiting you. Happy birthday. 23) You are the best doctor because you have taught me to listen to the doctor within. Happy birthday. 24) Happy birthday to the worst enemy of the germs inside my body. 25) You must be the only person on earth to get away with making people eat the yuckiest of pills and giving them the biggest of bills. Happy birthday doc. 26) My GP is not just a doctor. He is my friend, dietitian, physiotherapist and life counselor – all rolled into one cheerful person. Happy birthday. 27) YOU are my doctor of choice because HOPE is your medicine of choice. Happy birthday. 28) The word DOCTOR is comforting – it brings a smile to people’s faces, only until they see the bill. Happy birthday doc. 29) I’m lost for words. I don’t know what to write on a birthday greeting card for a man whose smile is the warmest greeting in times of sickness. Thanks for everything doc, happy birthday. 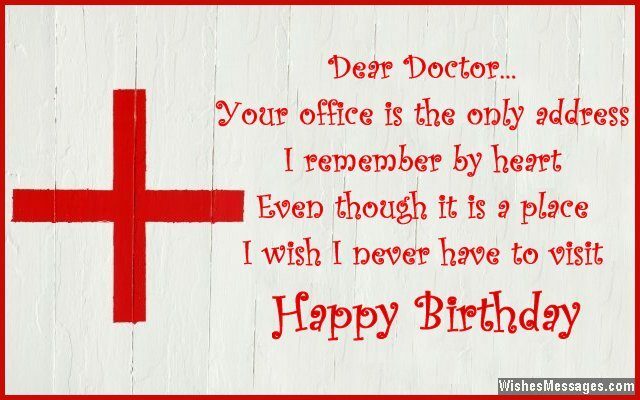 30) Dear doctor, on your birthday I pray that you never need to visit one yourself. Happy birthday. 31) Your office is the only address I remember by heart even though it is a place I wish I never have to visit. Happy birthday doc. 32) You are my best friend – only as long as I don’t need to take an appointment with you. Happy birthday doc. 33) For some people, you are no less than God. For some people, you are a source of inspiration. For some people, you are a caring angel. For some people, your kind words are supreme motivation. For some people, you are a ray of hope. For some people, you are a savior. You are more than just a human being, Happy Birthday doctor. 34) Happy birthday to the man whose birth has saved many other lives. 35) Ordinary doctors cure, extraordinary doctors like you prevent. Happy birthday. 36) Of all the doctors that I know, I like you the best. Every single time, you have put my worries to rest. Happy birthday. 37) Our relationship as Doctor and Patient is a strange one. The less we meet, the happier I am. Happy birthday. 38) There is humanity left in the medical profession because of compassionate doctors like you. Happy birthday. 39) There are some doctors whose manipulative practices and money sucking tactics have given the medical profession a bad name. But there are still heroes like you out there, who strive to be compassionate healers and the best doctors they possibly can. Happy birthday doc. 40) My husband is jealous of you because I have your number before his on my speed dial. 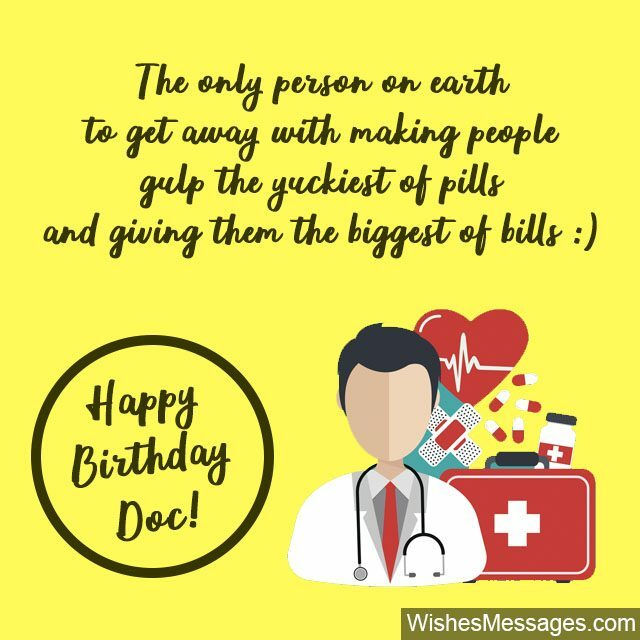 Happy birthday doc.prescribed by loving doctors like you. Happy birthday.